7 to all who are in Rome, beloved of God, called saints; Grace to you, and peace, from God our Father, and [from] the Lord Jesus Christ! Interpolation is a four letter word for some scholars: it can only be justified under extreme provocation such as when all the earliest witnesses leave not a shadow of doubt. Such a standard flies in the face of what we know about the transmission of ancient manuscripts, especially the canonical ones. See Forgery in the ancient world and List of scholars believing Paul’s letters were interpolated. Nonetheless I can understand why some authors play it safe by being very reluctant to treat any passage in Paul’s letters as an interpolation unless supported by widely acknowledged arguments. I’m not so conservative. If only one scholar produces very sound arguments that his or her peers fail to address then I’m willing to take the possibility of interpolation seriously. So much for the preamble. Sparks have flown between Christ Myth advocates and their opponents over the opening passage in Paul’s epistle to the Romans that declares Jesus Christ to be “of the seed of David according to the flesh” but these verses may have another significance for our understanding of how early Christian ideas evolved. So forget the mythicist debate for a moment. Many of us are aware of Hermann Detering’s arguments for Romans 1:2-6 being an interpolation laden with anti-Marcionite innuendo. I won’t repeat those here. Consider this a related post. I have also posted the 1942 argument of A. D. Howell-Smith for Romans 1:3 (who is come of the seed of David) being an interpolation. Again, consider this post related. Alfred Loisy (1935) makes a passing reference to Romans 1:3-4 (see the bolded passage in the side box) being a likely interpolation in Remarques sur la littérature épistolaire du Nouveau Testament, p. 9. These lines are anomalous padding within a standard introduction. J. C. O’Neill in Paul’s Letter to the Romans (1975) published a detailed argument for why we should consider all of verses 1b to 5a as an interpolation. (See the indented lines in the side-box. He also found the words I have italicized intrusive.) It is O’Neill’s discussion pages 25 to 28 that I set out below. Apion to Epimarchus his father and Lord, heartiest greetings. Polycrates to his father, greeting. O’Neill thinks that since Paul always ends his salutations with a blessing, he further decided in the earlier part of his introduction to assure his recipients that he had the authority to pronounce such a blessing from God. Hence he opened with a statement of his apostolic credentials. His introductions could thus be quite long. But there are two letters attributed to Paul that have exceptionally long introductions that require some further explanation: Titus and Romans. O’Neill points out the weakness of this view (that Paul is citing a pre-existing creed here) is that it has no follow-up in the letter. Why introduce a creed that has no relevance to the argument that follows? Codex Boernerianus, designated by Gp or 012 (in the Gregory-Aland numbering), α 1028 (von Soden). Dated paleographically to the 9th century. The main text is in Greek with an interlinear Latin translation inserted above the Greek text. Paul, servant of Jesus Christ, called an apostle among all the Gentiles on his behalf. O’Neill further suggests that the original creed has been redacted in order to drive home a particular message about the nature of Jesus. If it seems most likely that the original creed contained a doublet, “of the seed of David according to the flesh//the son of God according to the Holy Spirit”, then it appears that the line “by the rising from the dead” has been subsequently added to make an additional point. Whoever added this passage to Romans wanted to inject the idea that Jesus was declared to be the Son of God at the moment he was resurrected (thus imputing to Paul a belief he did not hold), or by a scribe who could not understand why the resurrection had not been mentioned in the original. Compare the non-Pauline 2 Timothy 2:8. Our Lord through whom we have received grace faithfully to obey. The reference to “the apostleship” in the last line (verse 5) in our Bibles breaks the surrounding thought but was added to give the creed some direct connection to the introduction of this letter where the apostle is establishing his credentials according to O’Neill. Since this view is supported by outstanding (non-mythicist) lights such as Alfred Loisy and J. C. O’Neill as well as by (anti-mythicist) A. D. Howell Smith, we can focus on the question of the development of early Christian thought for its own sake (i.e. without reference to the mythicist debate). The original introduction thus removes Romans as a piece of evidence that as been used to support the view that Christianity was a product of Davidic messianic hopes. It strengthens the very early date of the letter to the Romans given that it was written before such a formal credal statement was part of Paul’s vocabulary. The interpolation is further evidence of Paul’s letters being used in theological battles after his passing. Posted on 2015-02-17 09:19:30 GMT+0000 by Neil Godfrey. This entry was posted in Biblical Studies, Paul and His Letters and tagged Epistle to the Romans, Interpolations, O'Neill: Paul's Letter to Romans. Bookmark the permalink. As far as whether Romans 1:3 is interpolated, I think it is superfluous for the mythcist debate. There are several passages within the early letters that speak of Jesus’ ancestry, like the “Christ as a gift of Jacob” passage in Hebrews (Carrier lists all the relevant passages under the section on the Seed of David). It’s hard to imagine that *all* of these passages are interpolations. As you no doubt know those other references (e.g. Clement’s reference to Christ as a ‘gift’ of Jacob) are equally expected, in Carrier’s argument, for “minimal mythicism” as they are for the historical view of Jesus. Jacob, Adam, Enoch — these were pre-existent heavenly beings in Second Temple Judaism. I may well be wrong but I am less certain at this point that a messiah was required to be of the house of David. Enoch was not of David but was a messiah. Ditto for Bar Kochba. Via Romans 9:8 And Galatians 4, I think the Christians had a non-literal notion of descent. It may have meant something like “bearing a spiritual resemblance to” or “came as a result of promise fulfillment.” What do you think? Son of David as a title sounds reasonable, as does star of Jacob as a title. On the other hand, Paul’s qualifier “according to the flesh,” seems troublesome (why would such a qualifier be added to a title?) if we assume the authenticity of said passage. I think the answer to this may lie in the fact that the Greek phrase for “according to the flesh” is Kata Sarka, which can have a broad range of meanings, most commonly “according to human understanding.” Maybe Davidic descent was like an analogy to show Jesus resembled David spiritually, or that he was *like* a descendant, since he took over the Israeli throne. What do I think? I’m copping out for now, sorry. 🙁 I defer the question to those who have a far more complete knowledge of the relevant Greek language and literature. My reading priorities at the moment leave me preferring to follow the discussions/arguments from a variety of perspectives than taking the time to learn and read enough to figure it out for myself. But I like collecting the many possibilities in the meantime. There will come a time to revisit them, I do hope. The link to ‘similar passage in the Ignatian letters’ is dead. Although I find the hypothesis interesting, using 9th century evidence to establish the claim wouldn’t yield reliability for me. IMHO the version we see in G is an early Catholic form. It is already post Marcionite, with the terms δοῦλος ‘slave’ and κλητὸς ‘called’ representing a reference a Catholic Paul who is subservient (δοῦλος) and who was not different from others because it was not revelation but calling (κλητὸς) that makes him an Apostle like others. When the decision was made to have Romans head the Catholic collection of Paul, it caused multiple revisions. This is clear from the uncertain placement of the closing doxology, some manuscripts placing after chapter 14 (G omits but leaves space after chapter 14), P46 after chapter 15, and most after chapter 16, suggesting both chapters are independent additions from a later period. The Doxology is itself a pastiche, full of anti-Marcionite themes. The take away I want you to have is that the manuscript G is Catholic, and its flux represents the flux of the Catholic text which must have last for some time. The final creed came about because of a need to declare the authority of the Catholic Paul and the nature of his Christ. To understand this we should start with the most basic question, what are creeds and why would they be written? Creeds are statements of doctrine, sometimes called tenets of faith, which are used to distinguish one group from another. And this being the case we need to ask, from whom is the creed trying to separate their group from? To answer this we need to look at the terms of the creed. First the term, ἀφωρισμένος “set apart” is shared in Paul only with Galatians 1:15 ὁ ἀφορίσας με ἐκ κοιλίας μητρός μου “set apart from my mother’s womb.” In both case it is an announcement of authority. In Marcion (Galatians) is is “through his grace, to reveal his son in me.” It is an authority that required no human support, as Paul “did not immediately consult with any flesh and blood.” It is a divine revelation. But in the Romans creed the reference is back to Acts 13:2 where the Holy Spirit asks that Paul and Barnabas(!) be separated (ἀφορίσατε) from other Apostles for a mission that he called them (προσκέκλημαι – see κλητὸς in verse 1:1; note, Calling is associated with the Holy Spirit, a concept pretty much absent from the Marcionite theology and writings). The Davidic creed follows. I find it significant that the Gospel mentioned in Romans is the Gospel of God, while in Galatians it is the Gospel of Christ. I do not believe that is an accident, rather it is a point of distinction between the groups. In Marcionite form it was a medium sized letter in the middle of the collection following the same terse formula of the other letters. Only Galatians had an extended opening, and that was because it was the introductory letter to the collection. Glad to see however that G is being taken more seriously. Already Willem Christiaan van Manen realized that most of Romans is a post-Marcionite interpolation, especially the Davidic stuff. I’m not sure why you think that Paul didn’t believe this. ‘Son of God’ is a royal epithet, typical of the ‘royal psalms’ and so on; and he clearly does think that the resurrection is somehow the beginning of his political rule (over Israel and ‘the nations’). Thus the text or interpolation says he is ‘marked out’ or ‘delimited’ as ‘the son of god in (political) power’ with the resurrection. Basically it means the same as ‘christ’ as least in one sense, where it refers to royal anointment. The alleged interpolation doesn’t seem particularly un-Pauline in content, though it is a bit of a mess and would make good anti-Marcionite material. On the other hand, the kind of mess it is — the excessive overlay of thoughts and associations on one another — is sort of typical of Paul. If it isn’t an interpolation, the text could be thought a laborious elaboration on the sense in which he can be called apostolos, an expression that also seems to be have an association with politics or even diplomacy — an emissary, an ambassador, (here) a royal messenger, something like that. Thanks for your thoughts, Mark. As I understand it Paul is generally thought to have considered Jesus to be the Son of God from the beginning on the basis of passages like Romans 8:3 and Galatians 4:4 that speak of God sending his Son in the flesh prior to his resurrection. God is also called the Father from the beginning of creation. All things were thought to have been created through Jesus though from his resurrection he did, as you point out, become invested with special ruling authority over the creation. Matthew Novenson (whose book “Christ Among the Messiahs” I have discussed at length on this blog) does see hints throughout Paul’s letters that Paul associated Jesus with a “Davidic messiahship” and that this verse (Romans 1:3) therefore does not stand out as anomaly in his writings. I think this is a controversial point, though. I would like to see clearer evidence that Paul had the thought of Romans 1:3 in the back of his mind in other places in his writings to be sure that it is not an anomaly here. Have you seen Roger Parvus’s argument that the jumbled and messy thoughts that are supposed to characterize Paul’s letters might in fact be the result of interpolators trying to correct his original writings? Um, isn’t that gap in Codex Boernerianus’s Romans 1 just lacunae in the exemplar? That’s how Nestle-Aland 28 reads, not as a textual variant in the apparatus (as a so-called “consistently cited witness” for Romans, all Boernerianus’s genuine textual variants, including omissions, would be given in the NA apparatus, as are the tweaks it makes to verse 7) but as missing text (in the section of the book that gives the coverage for each manuscript). This isn’t the only lacunae in Boernerianus; interestingly, the manuscript shares most of its lacunae with Codex Augiensis, since a common ancestor of both must have had the same lacunae. By ‘lacuna’, do you mean a literal blank space for unrendered text? From the look of the image it does look as if the copyist just didn’t feel like doing the work at the moment. Is there some natural interpretation of his purpose? Is a diglot version is principally, or partly, for language teaching? It does seem like the purpose of this text might be too far from ‘giving an exact representation of the sacred Greek’ for too many inferences to be drawn. 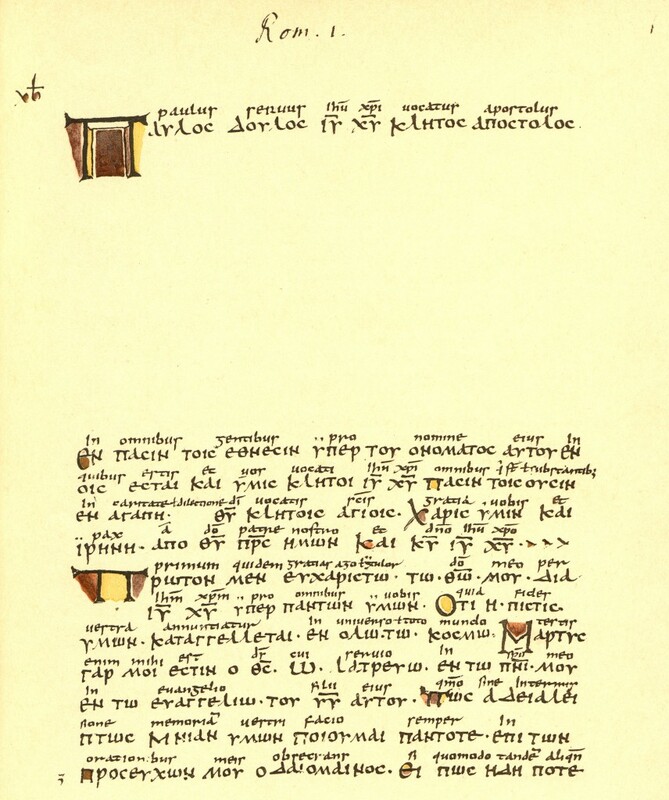 The blank spaces are there (at the Romans 1 bit and elsewhere in this same manuscript) because somewhere in the line of manuscript transmission there was damage at these points. The damage could have happened in the manuscript before this one, in which case this scribe was the first to place the gap, or earlier in which case the scribe is faithfully copying some prior scribe’s gap. I am not going to pretend to be terribly knowledgeable about manuscript matters, but my understanding is that handling damage in this way was normal, that such gaps are not uncommon in New Testament manuscripts, and that default practice for a present-day scholar when he sees such a gap in a manuscript would be to assume damage somewhere in the line of transmission, not assume a meaningful textual variant. As I mentioned, the Nestle-Aland text does not list this as a textual variant. Generally accepted textual variations of this size are (perhaps contrary to some currently popular beliefs) not terribly common in the New Testament — you probably know most of them already like the Pericope Adulterae, Longer Mark, John 5:4, the Comma Johanneum, the Western Text/Codex Bezae’s “Western Non-Interpolations” and a few more. If a meaningful variant is what the writer of the book being reviewed here is really arguing than I would expect some argumentation or citation thereof, because that really is a strong claim to make. I think I understand, thanks. I suppose there is still scope for a reading like Neil G. is gunning for — the copyist has left a blank space because he ‘knows’ that there is more text there from his copy of the Vulgate, when, unbeknownst to him, he is looking at a witness to an earlier tradition — or something like that. It does sound like it would be a little over-paranoid. Neil G. should post the connected text of O’Neill. There is a much wider discussion about the manuscript in the literature and I want to get on top of as much as that as I can before responding. What you suggest is not unheard of, though, and I think the most famous example of a “gap signifying text a scribe thinks should be there” is the excessive blank space after Mark 16:8 in Codex Vaticanus, suggesting to some that the scribe might have known of the longer ending which is missing in all the earliest texts. But I think that’s the only such gap in Vaticanus; in this manuscript there are multiple gaps. Also, Vaticanus is at the birth of Christian professionalizing scribal tradition; this manuscript here is five centuries into it. I’ve always been curious about possible interpolations in Paul, not only in a proto-orthodox Christian sense as you offer here, Neil, but also considering that the Valentinians claimed to be successors of Paul. In The Gnostic Paul, Elaine Pagels presents Gnostic exegesis of Romans 1:1-7, referencing the Gnostic Christian, Theodotus. Interpolation or not, Valentinian exegesis cleverly turns traditional interpretation on its head with “David” becoming a metaphor for the demiurge himself. One needs to know the symbolic code to comprehend how Paul is teaching in two different ways to those with different understandings. So, I wonder whether Valentinians were merely countering theological interpolation in this passage or, in the case of no interpolation, whether, by introducing a pneumatic Christ only “found in human likeness”, they were amenable to interpreting a more original Paul. This is not at all to say that Paul was gnostic. It seems that those theological battles you mention found Paul to be a particularly convenient playing field. Good. Also, interpolation often occur at the beginning and end of texts. As I reread this article a few points Neil makes stand out to me. The first is the now pervasive view of everything through the historicism vs mythicism debate that is in vogue. It is an unfortunate situation as everything and everyone is forced into one of two camps, which looks increasingly like a bipolar political debate rather than scholarly investigation and possibilities. This interpolation debate needs a better frame of reference without the baggage. The second is the observation by Neil that interpolation is a four letter word. For me this is vista moment, making me realize how I have moved far from the mainstream. I have long come to the opinion that the New Testament, especially Paul and certain of the Gospels came together in something more like a snowball, layers of authorship with often contradictory theologies. But for most scholars the snowball implies late authorship and complex development. So they avoid it, as it may overturn everything they have ever done or thought. This I suspect is the reason so many people examine Paul without the slightest effort to truly examine the Marcionite versions of the Pauline letters. It would complicate their own picture, make them rethink everything. As for the greetings, I think we need to consider that the epistles are really tracts, and the greetings and endings are quite possibly the product of the collector, binding them together. First a Marcionite, and then a Catholic. If the greetings are recognized as artificial, a new avenue of investigation opens up. I hate saying nothing more than simply “I agree. Well said.” But I agree. Well said. Now for my guilt therapy…..
Yep. You see this especially in discussions of interpolation, such as this one, and in discussion regarding “redating” (or “late dating”) this or that text. It’s as if our exegetes are already well past the honeymoon stage and recoil in terror at having to do the work of text criticism and dating because they might have to admit that they did not know their love so well as they thought. That facsimile of Codex Boernerianus, weird that it’s got a ten to twelve line gap in its text, innit? Time to find another image, so I can play McGrath’s Advocate. Or not. Guess I won’t be. Carry on.